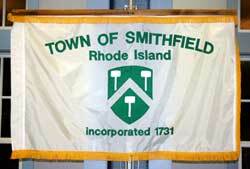 The seal of the Town of Smithfield, Rhode Island, composed by a local artist, Neil Salley, Jr., consists of a circular disk, upon the outer edge of which contains the words “Town of Smithfield Rhode Island,” and upon the bottom the date of which the Town was incorporated. The year of incorporation is given in both the Julian (1730) and the Gregorian calendar (1731). In the foreground are a mill and a body of water, representing the foundation the Town was built on; the Town’s coat of arms, a shield bearing three blacksmith hammers, that have come to represent the three villages of Greenville, Georgiaville and Esmond; and an apple tree representing the Town’s many apple orchards. Across the center of the disk are a village for the Town’s several small villages; the Smithfield Town Hall; the Greenville Baptist Church; the Smith-Appleby House, the Town’s oldest structure; and a farmhouse. In the background stands Wolf Hill with the sun rising over the Town. This seal was first used around 1999. The above logo was used around the years 1997-2002. The logo incorporates many symbols of Smithfield life including mills, industry, history, apples, town hall, the Smithfield Sentinel, Smith-Appleby House and the three-hammer logo. This seal was used until around the year 2000 and can still be seen on the Town flag (below). A shield bearing three blacksmith hammers. It is speculated that the hammers represent the three villages of Greenville, Georgiaville and Esmond – it is incorporated in the present Town seal above. The discrepancy in the year of incorporation is given in both the Julian (1730) and the Gregorian calendar (1731). Another take on the above logo is that it is a good example of “canting arms”, as the logo has three white hammers (“smith”) on a “field” of green. (Canting arms are heraldic bearings that represent the bearer’s name in a visual pun or rebus.) per @SamGHoward on Twitter. Photo contributed by Kenneth A. Brown, Sr.